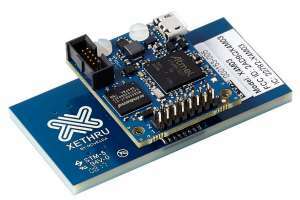 The XeThru X4 is a low-power Ultra Wideband (UWB) radar “system on chip” (SoC) with center frequency in C or X-Band. The transmitters bandwidth is up to 1.5 GHz. XeThru X4 is designed for use in presence sensors, i.e. it detects human presence by detecting all major and minor movements in a room.